For my money, the easiest and most forgiving yakitori staple is negima: juicy chicken thigh alternately threaded onto a skewer with sections of scallion. Because thighs are naturally high in connective tissue and fat, they end up juicy even if you don't precisely measure temperature as they cook. Chicken thighs are loaded with connective tissue and fat, making them perfectly juicy and tender even without a thermometer. 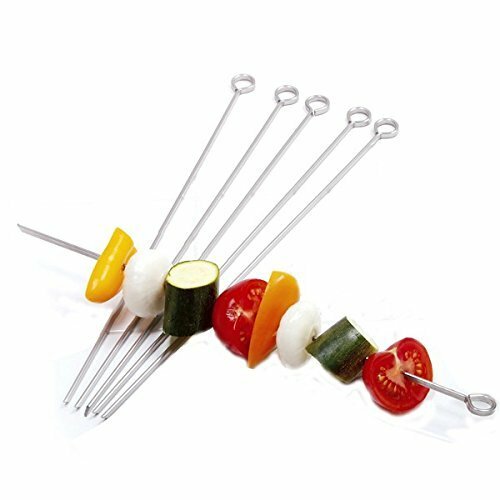 Moderate heat and a sweet and savory glaze give these skewers intense flavor. In a large bowl, toss chicken pieces with 2 teaspoons kosher salt and a few grinds of pepper. Thread 2 to 3 pieces of chicken onto a skewer (enough to add up to around 1/2 to 3/4 inch when pressed tightly together), then thread a segment of scallion onto skewer. Continue alternating every few pieces of chicken with scallion until chicken and scallions are used up, using as many skewers as necessary. Make sure all the meat and scallions are tightly packed. Place chicken skewers directly over the hot portion of the grill, cover, and cook, turning frequently, until chicken is well browned, scallions are tender, and a piece of chicken looks cooked when removed and cut in half with a knife, about 10 minutes. Season with additional salt and pepper 2 to 3 times during the cooking process. Brush chicken and scallions with teriyaki glaze and cook for 30 seconds. Turn, brush second side with teriyaki, and cook for 30 seconds longer. Remove chicken from grill and allow to rest for 1 to 2 minutes. Brush with additional glaze and serve immediately.